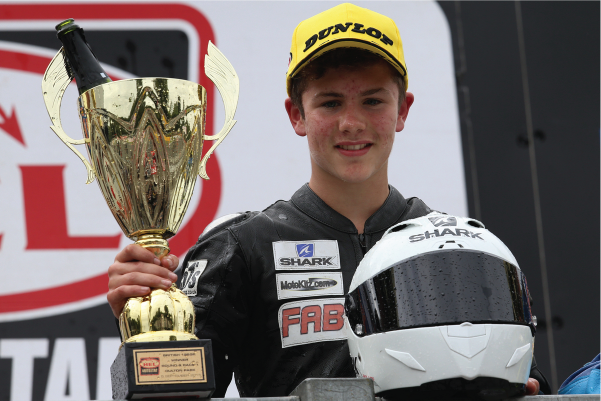 14 year old Cameron Horsman took his sixth and seventh race win of his debut season in the British Motostar Championship this weekend, on his first ever visit to the TT Circuit Assen. Cameron travelled to the Dutch racing capital full of confidence, after his dominant performance two weeks ago in leafy Cheshire at Oulton Park. Assen was a circuit that Horsman had never seen until Friday morning, only learning it on a computer game before arriving in Holland. But this lack of knowledge around the 2.8 mile famous circuit didn’t stop him, and from the off on Friday morning Cameron was quick. He ended the free practice session in 17th place, and third quickest 125 after posting a 1:57.1, only 1.9 seconds behind the fastest 2 stroke. Qualifying One on Friday afternoon saw Cameron improve in time by almost five seconds, posting a 1:52.6, lining him in provisional 24th on the grid of 39 riders, and 4th 125, only a second off the 125 pole man. Unfortunately due to poor weather conditions over night, the second qualifying session was run in wet conditions, which meant Cameron couldn’t improve on his time and would line up in 24th place for the afternoon’s 10-lap sprint race. 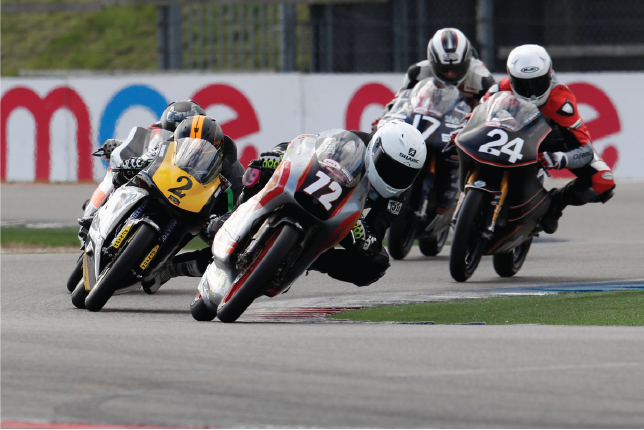 From the start Cameron made a great leap, and ran with the leading group of 125’s battling and swapping places with Wesley Jonker, Josh Owens and Tasia Rodink all race. The Lewisham man then made his move on the final lap, and lead into the final chicane as carnage ensued behind him, Rodink and Owens falling on the last lap and Jonker the final corner, leaving Cameron to cruise over the line, taking his 6th win of the season. Cameron’s lap time from race one meant he would stay in 24th place on the grid for Sunday’s feature race, and from the lights Cameron made a great start once again, he was leading the 125 race and was running in 15th position of the main race, with lap times over 2.5 seconds quicker than his previous best, until the rain came. The race was red flagged, and was re run under damp conditions in a 6-lap dash. Cameron made a great start from the lights and ran as the first 125, battling with Josh Owens and swapping positions all race long on a drying track. On the last lap, Cameron made a hard move in the last chicane and won the drag race to the line to take the double 125 win, and an overall top ten finish. After the race Cameron said: “This weekend has been mega, I’d never been around Assen before apart from learning it on the Xbox, so to come away with the double is really good. “I’ve learnt so much this weekend, about the bike and how to race in this class and I feel much more confident on the bike. I’m closing in on third place in the Championship, and the final four races of the season are going to be so important, because I really want to finish in the top three. Cameron is now just seven points behind the third place Aprilia rider Andrew Sawford in the standings, and sits on 228 points, with only four races left. 14-year-old Cameron Horsman took his fifth win of the year on board his EE125 machine, after a dominant three days at Oulton Park this weekend. Cameron headed into the ninth round of the Championship full of confidence and belief, after another positive weekend last time out at Cadwell Park. The free practice sessions saw the Lewisham man fly out of the blocks, picking up from where he left off at Cadwell last time out. He was only two tenths behind the fastest 125 Josh Owens in the first practice, and he then topped the 125 class in the second session by seventh tenths, and 10th overall. Qualifying one on Saturday morning saw the riders have to work on a damp circuit, which Cameron handled well posting the 5th fastest 125 time, but knowing full well the track would dry for the afternoon session. Q2 would see Cameron take the 125 pole position by four tenths of a second after setting a time of 1:49.600, eight second faster than his qualifying time set earlier in the season, lining him up in 16th position for Sunday’s race. From the leap off the line in Sunday’s race, Cameron got a fantastic start and started to pick his way through the riders in front. As he made his way into 12th position Cameron set his sights on the group ahead, but as he posted his fastest lap of the weekend at 1:48.006, he just couldn’t pip his way into 11th place and took the flag in 12th, also taking the 125cc win by 20 seconds, his fifth of the season. Cameron now sits in fourth place in the HEL British Motostar Championship on 178 points, only 35 behind Mark Clayton in third place. Cameron now has a two week break from action before heading to the Cathedral Of Speed of Assen in Holland for round 10 of the Championship.